Chic Villas offers a handpicked selection of luxury rental properties in the most beautiful regions of France. This time we’re off to the Basque Country on the south-west coast of France, with a line-up of the kind of villas that dreams are made of. Fancy making yourself at home in a luxury Basque villa? Here’s our pick of the best. 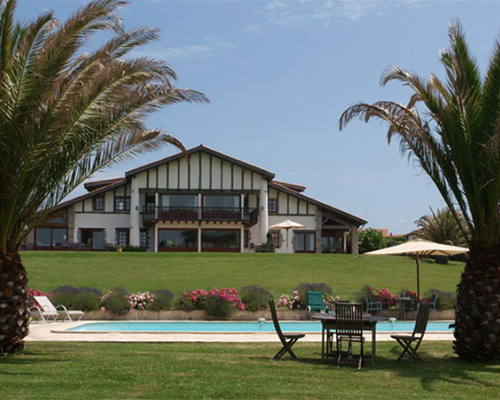 This stunningly modern luxury holiday villa is in Anglet, just inland of Biarritz. The design is contemporary and wooden, and the facilities top-of-the-range. Large glass doors open seamlessly onto a beautiful beach-inspired setting. A huge living area is perfect for entertaining while enjoying the view of the garden and pool. This villa’s trump card: you can walk to the beach. Next, we head to Saint-Jean-de-Luz, for a luxury villa with a difference. Behind the traditional Basque architecture lies a spacious and inviting interior. The bedrooms are big and bright, and the beautiful rustic dining room is an invitation to enjoy long, lingering meals with family and friends. Outdoors, you’ll enjoy the sprawling five-hectare grounds with a terrace, seating area and heated swimming pool. This villa’s trump card: Breathtaking views over the Basque mountains. This atypical Basque villa is big enough for all guests to have their own space, with six bedrooms in the main building, and three in the cabin. This luxury villa is ideal for a getaway with friends to explore a beautiful corner of the world. You’ll also like the veranda, where up to 12 guests can dine beside the pool, and the sundeck looking out to the horizon. This villa’s trump card: direct access to the beach. 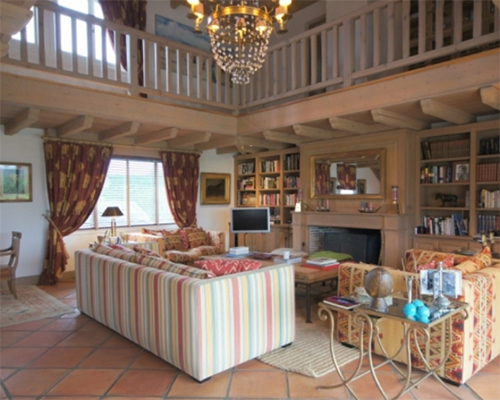 This luxury Basque Country villa in Saint-Jean-de-Luz is an absolute gem, inside and out! From the beautiful interior and spacious rooms, to the fabulous 17m x 3.5m pool with stunning ocean views, this sunny holiday property has all the ingredients for a fabulous holiday. 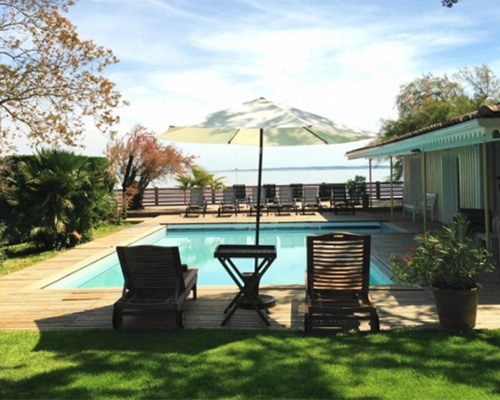 Set in a quiet location just a few streets down from the centre of Saint-Jean-de-Luz, it’s a slice of heaven on earth. This villa’s trump card: the tennis court. 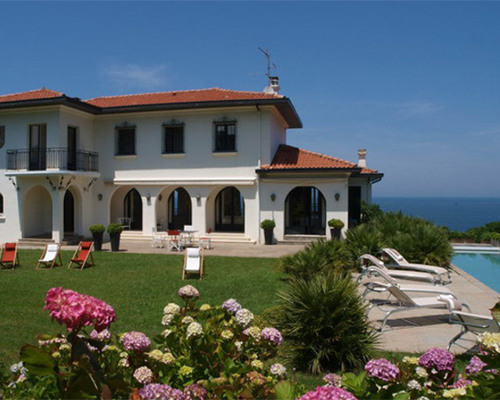 Designed in traditional Basque Country style, this lovely luxury villa is in Arcangues, near Biarritz. Light-coloured wood features throughout the property, with a thoughtfully-chosen décor creating a cosy and inviting feel. The spacious interior of this luxury Basque villa is nothing compared to the vast outdoors – it is set in 6,000m² of grounds, with a pool in the garden offering unhindered views of the mountains. Holiday in the Basque Country and you’ll get to explore a beautiful region with lots to do. There’s no shortage of chic seaside towns – Bayonne, Biarritz, and Saint-Jean-de-Luz to name but a few – but there is also a whole host of quaint little villages where you can experience the local traditions, including great food and wine! And if it’s water sports you’re after, then renting a villa in the Basque Country is a great way to enjoy some of the very best spots, with the Atlantic Ocean on the doorstep.